Lockheed research into compound rigid rotor helicopters began in the early 1960s using the XH-51. In 1966, Lockheed's design for an operational attack helicopter, the AH-56 Cheyenne, won the contract to build the US Army's Advanced Aerial Fire Support System (AAFSS). The Cheyenne had a 3,435 shp General Electric T64-GE-16 turboshaft engine that powered a rigid 50 ft four-bladed rotor, as well as a 10 ft three-bladed pusher propeller and a four-bladed anti-torque rotor on the tail. In horizontal flight, almost the entire engine output is used to drive the propeller. 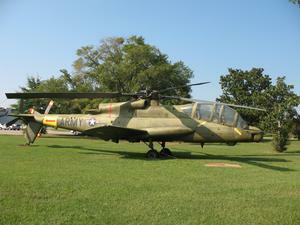 The AH-56 weighed 12,000 lb empty, had a 55 ft long fuselage and a 27 ft wingspan. Maximum vertical take-off weight was 22,000 lb, but a short take-off could be made at 28,000 lb. First flight was on 21 September 1967. A maximum speed of 277 mph was reached. The third of ten prototypes crashed on 12 March 1969 when the rotor impacted the front and rear fuselage, killing the pilot. The AH-56 was highly agile and a very capable weapon system, but development was halted in 1972, due to defense cutbacks. A production order of 375 AH-56s had been approved in 1968, but canceled the next year, also as a result of budget cuts. Resources related to the YAH-56A Cheyenne, provided by the Vertical Flight Society. 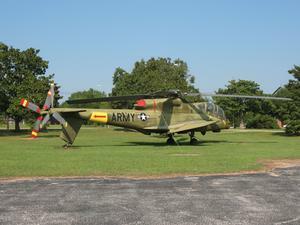 Resources related to the YAH-56A Cheyenne, provided by public sources across the internet.